With the choice of Duropal Classic and Quadra profiling, Duropal laminate worktops offers a worktop that makes your culinary activities something to look forward too. With a Duropal worktops, there are plenty of colours to choose from meaning your dream kitchen can easily be achieved with these stunning Duropal kitchen worktops. When looking for an affordable alternative to the more expensive solid surface option, look no further than our range of Duropal worktops from our laminated worktops selection. We stock seven finishes that make up the Duropal worktops range: Crystal Stone, Enhanced Semi Matt, Fine Grain, Gloss, Rustica, Top Face and Top Velvet. The Duropal worktops Top Velvet finish is beautifully sleek which has an elegant light effect, a fantastic addition to any kitchen. 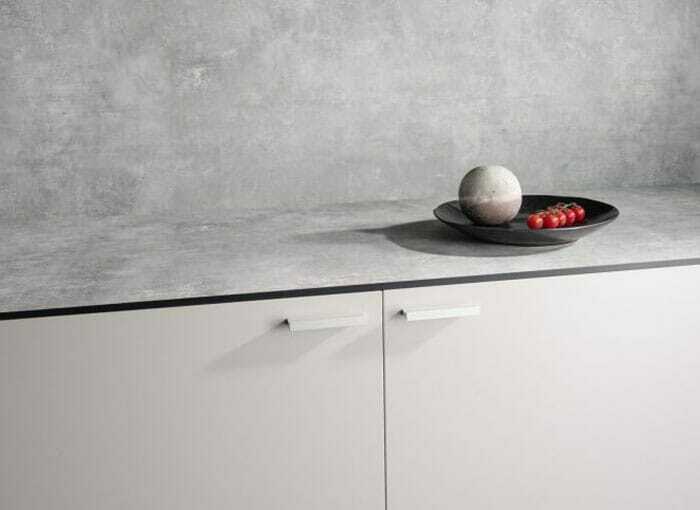 The Fine grain Duropal worktop finish has a fine texture which is associated with both ceramics and stone work surfaces. The matt appearance is incredibly popular for its distinct subtleness. If you’re seeking a gloss effect Duropal laminate worktop, then they have you covered. The high gloss look is in ‘vogue’ at the moment and offers a high gloss finish that is beautiful and designed to be more robust than standard gloss work surfaces. The Enhanced Semi Matt finish from Duropal Worktops offers a superb natural and luxurious feel to any kitchen design. 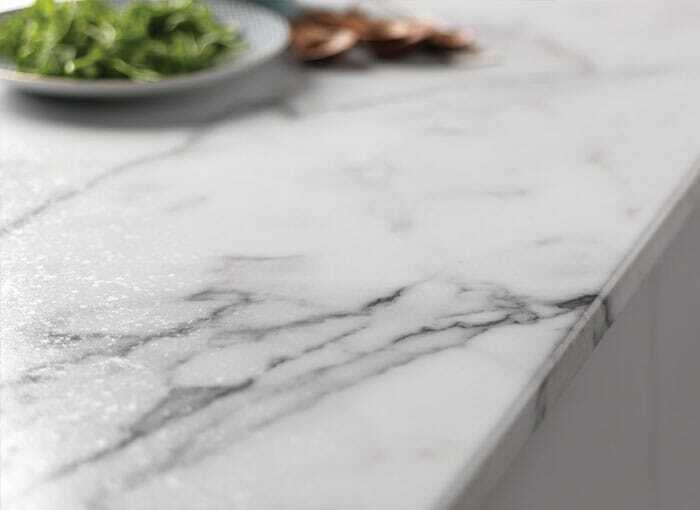 Whilst the Duropal worktops Top Face range is a true classic in terms of its neutrality. It also offers a resistance to fingerprints making it a great addition to a busy kitchen. Aside from our Duropal kitchen worktops range, we also stock stunnin Axiom kitchen worktops, Artis worktops, Prima worktops, Nuance worktops, Odyssey worktops & Omega worktops. Each brand will bring something different to your kitchen design. The most desirable worktops are usually ones that are easy to maintain, with Duropal worktops you get a high performance laminate work surface that can easily be cleaned with just a damp cloth meaning you can keep up the luxurious look of your Duropal kitchen worktop with little effort! We do advise against using wired brushes on your Duropal worktops as this could cause permanent damage. Duropal worktops are incredibly resistant and durable. This is due to the special resin that Duropal use in their work surface manufacturing. 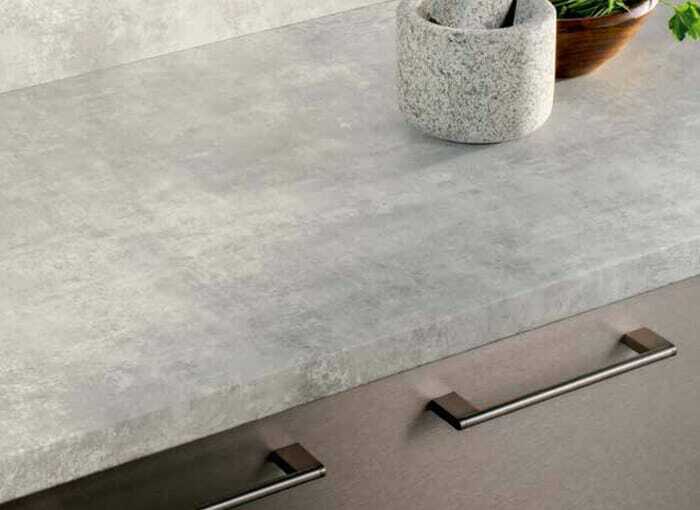 This process makes the countertop scratch resistant whilst Duropal kitchen worktops are have high resistant to impacts which will give you piece of mind when working with this wonderful surface. Duropal worktops are also both chemical and heat resistant. Due to Duropal’s rigorous testing process, they are even confident that a lit cigarette placed onto it’s stronger surfaces will not cause any lasting damage. At HC Supplies, we’re a leading Duropal worktops supplier, thanks to our fantastic relationships with our partners, we’re able to pass on great savings direct to you. Our Duropal worktop prices are incredibly competitive, you’ll be hard stretched to find better Duropal worktop prices anywhere else online! Upgrading your kitchen work surfaces is one of the easiest ways to revamp your kitchen economically and at HC Supplies we have a huge range of Duropal laminate Worktops to choose from. Duropal Kitchen Worktops are the ideal alternative to acrylic based granite and stone worktops at a fraction of the cost. All Duropal Worktops in the classic and quadra profiles have a distinctive seal designed to safeguard against moisture and steam. Also the profiled front edge is intended to prevent spillage from disappearing into drawers and cupboards. As a leading Duropal worktops stockiest, our showroom situated in Doncaster is packed full of Duropal kitchen worktop samples, why not come and check our our range and find the perfect worktop for your kitchen design? Our friendly and experienced team of staff are on hand to answer any questions you may have regarding our Duropal worktops range. 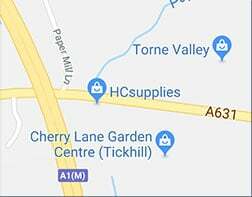 At HC Supplies we believe we offer one of the most comprehensive Duropal laminate worktop selections anywhere in the UK. We also offer a no fuss guarantee on all our worktops for your 100% satisfaction. For a more people friendly kitchen why not add a breakfast bar which, apart from gaining extra space, will create a central point for relaxing with friends and family. Our entire Duropal range can be delivered direct to your door within just 2-7 working days!